Where did it all go wrong? One minute you’re in love, the next it’s all over. 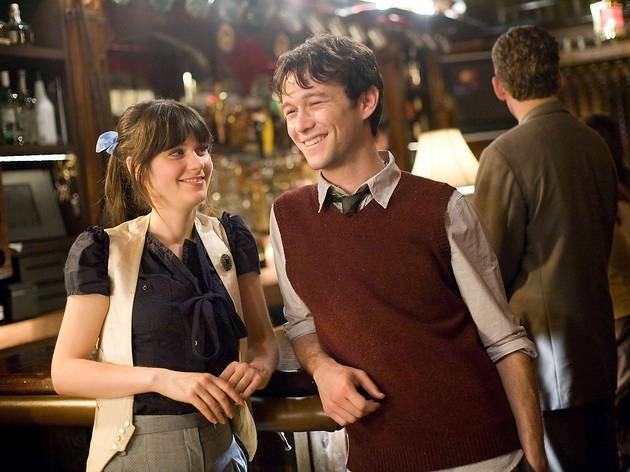 In this rom-com-as-postmortem, greeting-card writer Tom (Joseph Gordon-Levitt) tries to pinpoint the key moments in his ill-fated liaison with co-worker Summer (Zooey Deschanel), as the movie toggles hither and thither across individually numbered days in lieu of a familiar linear trajectory. When a stentorian omniscient voiceover announces that ‘this is not a love story’, it’s easy to figure we’re in for another dose of smugly hermetic US indie-cool, yet no matter how clever-clever Marc Webb’s film gets (and it does), it never overwhelms the subtle registration of this young man’s bitter yet enriching learning curve – it takes a broken heart to shatter our youthful illusions about love and prepare us for clear-eyed, grown-up romance. Gordon-Levitt and Ms Deschanel are simply ideal as these bright young things: he always suggests that fires are burning beneath that deadpan wit and forbidding exterior, while she does the combination of pixie-ish Lorelei and withholding emotional sphinx to a tee. Their workplace affair is certainly believable, though perhaps the problem with Scott Neustader and Michael H Weber’s otherwise peppy script is that it relies on a shared nexus of pop culture references (The Smiths, perhaps inevitably) in lieu of individual chemistry, and flings in smart pastiche (Gallic art-movie torpor, a colourful Demy-esque dance number) when it might have delivered more authentic passion. So, if it just misses being this generation’s ‘Annie Hall’, it’s still deliciously refreshing, sweet and fizzy. A sherbet dip of a movie. 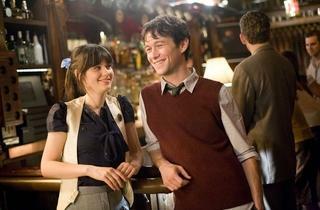 500 Days of Summer is one of my favourite movies, ever. The very frank narrative is a refreshing change from other rom-coms. Gordon-Levitt and Deschanel work perfectly, with believable charge and perfect delivery. The soundtrack ranging from The Smiths to Regina Spektor is a joy to listen to. The plot itself is assuring to anyone who has an ex or been in a relationship. Wonderful, I can watch regularly and never get bored. I'm surprised at all the negative comments. This is a well thought out, original and funny romantic comedy. Easy and enjoyable viewing about two very likeable people. I'd highly recommend it! I watched this film and thought it was actually a good film until the end the ending is quite frank-illy rubbish it makes no sense but like the idea of autumn lol but is there another one going to come out called 500 days of autumn lol!! A laundry list of, 'Hey that'd make a good scene in a Rom-Com, wouldnâ€™t it?' Mr. Fear was kind with his three star review, the whole thing being episodic and very much a retread of other better films. What is its own is thin & dressed up in indie-pop LP sleeve graphics. Zooey Deschanel gives a subtle performance almost pulling at you, like her in film non-boyfriend, to enjoy proceedings more than you really should whilst lacking any of Cameron Crowe or Judd Apatowâ€™s clarity for this kinda stuff. Great script and these two are truly electric together. This is a marvelous and thoroughly enjoyable film. It's mostly funny in a make you smile kind of way but a couple of times I laughed out loud. It's not a saccharine sweet romk-com so if you go looking for a stereotype rom-com it might not be for you. It's intelligent and wity and I heartily recommend it. No idea why there are so many negative reviews here. Would definitely see again when it comes to DVD. Not sure where the Annie Hall comparisons come from. The film this reminded me of was Gregory's Girl, but whereas that film was laugh out loud funny, this is only mildly amusing. This is one of the n icest films I have sen in a VERY long time, it looks good, if feels god, the acting is spot on and it avoids cliches. It's refershing to see it from a man's point of view and that fr once the lady isn't teh one ending up crying for her lost ove. Not a lot happens action wise, but its a modern tale of love and young expectations. It's quirky but not annoying, fun but not dumb, and full of lovely visual touch. I highly recommend it. crapcrapcrap film dont see it. i wish i didnt. What a waste of time watching this mawkish film was and certainly a waste of the talent of Joseph Gordon-Levitt. The premise seems to be that he's hopelessly smitten while she is cynical, damaged and unwilling to commit. It turns out though that what she was waiting for was "love" which turned up one fine day out of the blue (I use these cliches advisedly). In next to no time, she is flashing a diamond sparkler, then married (in about 5 minutes since meeting her true love of a husband) and her distraught ex falls into a pit of loathing self-pity. Frankly, I thought he had a lucky escape. This film was a disgrace. A film predicated on the female character not wanting a serious relationship; what a fantastic idea, a reversal of traditional gender roles in romantic comedy. Except it isn't; in the end this film puts everybody neatly back into their boxes in the most depressing sell out I have ever encountered in the cinema. There is a complete absence of humour, none of the scenes are long enough or any of the characters developed enough to allow for anything approaching comedy. In fact, I found this film depressing in its representation of love as a shared interest in bands, vintage clothing and kooky behavior. This film fails for the same reason the relationship fails, because it is so resolutely in love with itself to preclude any truth or real emotional interaction. I am disgusted that this underwritten, flaccid, offensive, lazy, corporate engire was worthy of 5 stars. Time Out should be ashamed of itself for rewarding this joke of a film. I can only conclude that your reviewer has not seen Annie Hall. All these comparisons to Annie Hall are detracting from how great the film actually is. (500) Days of Summer is a great film and quite a realistic approach to romance and relationships in the face of other rom-coms around nowadays. That's not to say the film is depressing or boring though. It has a true wit, humour and depth and the two leads have great and believable chemistry with one another. I like this film so much that I will actually go watch it again at the cinema. Enjoying this film is dependent on you finding the leads charming: their appeal wore thin pretty quickly for me, All its best ideas are ripped off from other films, and it projects an overwhelmingly smug 'oh-we're-so-hip-it-hurts' tone. It certainly can't hold a candle to something of the wit, laugh-out-loud humour and insight of Annie Hall - why anyone makes such a comparison is beyond me. A few Nouvelle Vague references do not a classic make! A well-executed, well-acted and all-round perfectly reasonable drama, this film presents a nice, even insightful portrayal of the two central characters. Ultimately, though, for me it was a bit of a non-event. Comedy when it did happen was effective, but it was only an occasional feature. The non-linear presentation was gimmicky and tiresome. In all honesty there were moments about half way through the film when I felt it was going nowhere, but it picked up a little momentum nearer the end (though still not much). ... I would like to register some disappointment at the description of this sort of offering as a romantic comedy or any sort of comedy for that matter. A fair few moments of genuine humour spread out over the course of a drama do not turn it into a comedy. This film is a drama with humour, not a comedy. I hope people will see this little gem of a film, it's nice to see Joseph Gordon-Levitt and Zooey Deschanel getting roles where they are allowed to be funny. Nicely paced throughout with a killer soundtrack. Doesn't overstay its welcome like the majority of films I've seen this year. Plus it's not as annoying as "Juno". Just seen the film at a preview. It is funny, sad uplifitng and yet also at time soul destroying. The music is excellent. Not sure re Annie Hall but maybe this generations When Harry Met Sally. Agree the two leads are perfect for the roles. Well worth a visit. What a waste of time this film was. At the end of the film you think 'why bother making this film' - nothing to remember it by and not much comedy in it either. Broken Embraces is excellent. Go and see it.